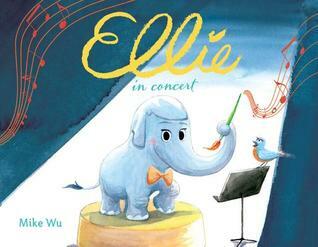 Mike Wu is the author and illustrator of Ellie, which was selected as NPR's best of 2015. He is also the illustrator of The Oodlethunks series. When he's not making books, he animates at Pixar, where he has worked on The Incredibles, Ratatouille, Up, and Toy Story 3, among other movies. He attended the California Institute of the Arts, and he is the creator of children's clothing and gift line Tiny Teru. Mike lives in the Bay Area with his family. Visit him online at theartofmikewu.com. This was a cute little book that I pretty much knew all the words to which was AMAZING! AMAZING!!! It is cute and I loved the music we got on the dust jacket! Great book for any time other than bed time! Great for kids of all ages.